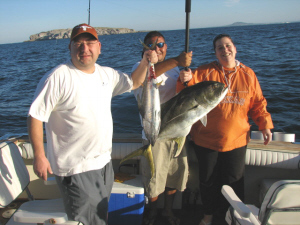 FuN, fUn, FuN… Small Gamefish, Plenty of Action! There are certain conditions and times of the year when those with some experience will remember and then take the time to check out from time to time. When we see the colder water start to go up in temperature and at the same time we see the water getting dirty we know the currents are changing. Currents don´t change overnight and it takes time for the water to change in temperature as well. So once this starts happening we can have as much as a week of great fishing in an area where few will venture. So you can imagine how those in the know will keep this area a secret as long as possible as it explodes with action that is relatively close in. The Rooster fish out there are taking baits of all sizes so there is no need to worry about presenting the correct sized bait for the time being. If surface trolling running poppers will work well as will the three and six inch silver diamond jigs. These fish are for the most part not picky and will hit anything that is splashy or shinny. Off Sayulita, around the corner and up from Punta Mita the Rooster fish have fallen off a little. But the Dorado are picking up in numbers (nothing major for the moment), the Sierra Mackerals have gotten huge for the species of 25 to 35 lbs! Snappers are here as well around the rocks, but the primary players will be Mackerals, Jack Crevalls (larger at 340 lbs), Snappers, Pompano and Rooster Fish which are increasing in numbers. The bay is full of bait, the water temperatures are up and down as is normal but they are creeping up. So this is all good news. As we move into March we should see the Sailfish coming back soon. Buy the middle to end of April we should see the Dorado come back. Last year it was July before we saw any size to the Dorado, but that was a La Nina year so looking back it wasn´t that surprising. Jack Crevalls are still in the bay and picking up in numbers and size by the day. The six hour trips are worth their salt now since it gives you enough time to reach the far end of the bay in both directions which insures you have plenty of action. My boats heading out in the bay the last few days have been hooking into at least twenty fish a day! So while the fish may be winter sized, there are decent numbers out there so people are catching fish and having light tackle fun! Looking around the area Barra to the north and Manzanillo to the south both have lots of Dorado (or Dolphin or Mahi Mahi), Sailfish, and even Marlin. The water temperatures there are a touch warmer, but the fact that Barra Navidad and Manzanillo are both north and south of us is a good indicator that the currents are moving. The simple fact that Puerto Vallarta is a little on the chilly side in comparison is of no concern since we are moving into late winter now and shortly the gap will fill in with warmer water as well…. Stay tuned! Just a reminder, Summer is coming and spring break happens in late April this year. If you are thinking of doing a Yellowfin Tuna or Marlin fishing trip this year (summer begins for monsters in mid July), remember early bookings will save you money. With the negative and bogus news of how Mexico is dangerous the prices and numbers of people visiting this summer will be down. This means you will save some serious cash if you book early and it looks like it will be an early summer this year. So start salting your pennies, nickels and dimes away for that fishing trip this year. Just a reminder, the press in the states is blowing the situation with the narcos or drug cartels out of proportion. 60% of whatever you hear is happening in the places where it has always happened, nothing new is happening here! If the press would show real numbers / statistics on the drug cartel situation here in Mexico you would realize that sensationalized headlines sell news as they promote Obamas agenda to keep the tourism dollar in the states! To put it this way, If I was thinking of the United States as if it was size of how Mexico is perceived, would you not go to Los Angeles because somebody got shot in Florida? Well it’s just that stupid. There are not bands of Mexicans looking to kill tourist, there are not drug dealers with guns in the streets. The only way you will find trouble in Mexico is if you go looking for it. If you go into the slums of Detroit, Baltimore, Washington D.C., Houston, New York, Los Angeles and the list goes on, looking for drugs then you will have the same situation. Mexico is statistically safer than Brazil! Mexico is not dangerous and no matter what, there will always be crime in every corner of the world, you can´t get around that. But if you are smart, you can take advantage of the bogus perception the press has created about Mexico! As the sheep run away from the nonexistent wolf, you can zig when they zag and get some great deals, in a safe place for the whole family and have Mexico pretty much to yourself! Like the Swine H1N1 lies they spewed all over the place creating the perception you would die in Mexico from this disease, the press has a chip on it’s shoulder when it comes to Mexico. Mexico is safer than most of the larger cities in America and you wouldn´t avoid New York or Baltimore which are statistically speaking more dangerous than Mexico. So be informed, see through the smoke and take advantage of an opportunity! Until then, take care and don´t forget to kiss your fish! This entry was posted in Am I Safe In Mexico, Beach Vacations, Big Game Fishing, Deep Sea Fishing, Family Vacations, Fishing, Fishing Articles, Fishing for Sailfish Fishing, Fishing in Mexico, Fishing in Puerto Vallarta, Fishing Reports Puerto Vallarta, Florida Sportfishing, Gulf of Mexico Oil Spill, Marina Vallarta, Marlin fishing, Marlin Fishing in Hawaii, Marlin Fishing PV, Mexico, Mexico fishing, Mexico Pirates, Mexico Safety, Mexico Safety Concerns, Mexico Tourism, Pictures Fish, Porto Vayarta, Porto Viarta, Puerta Vallarta, puerta viarta, Puerto Vallarta, Puerto Vallarta Sportfishing, Puerto Vallarta tourism guide, Puerto Vallartra Fishing, Puerto Viarta, Restaurants in Puerto Vallarta, Safe Travel in Mexico, Sport fishing, Sportfishing in Puerto Vallarta, Sportfishing Puerto Vallarta, Sports Travel, Travel, Travel Sports, Uncategorized, Yacht Rental, Yellowfin Tuna Fishing and tagged Big Game Fishing, Bloody Decks Puerto Vallarta, Cabo Sportfishing, charters, Deep Sea Fishing, Fishing, Fishing Puerto Vallarta, Fishing Tours in Puerto Vallarta, Marlin, Marlin fishing, Mexico, Puerta Viarta, Puerto Vallarta, Puerto Vallarta Bloody Decks, Puerto Vallarta Fishing Reports, Puerto Vallarta Tours, Sailfish, Sportfishing, Sportfishing in Cabo San Lucas, Tours in Puerto Vallarta, Travel, Tuna fishing, Yellowfin tuna, Yellowfin Tuna Fishing. Bookmark the permalink.